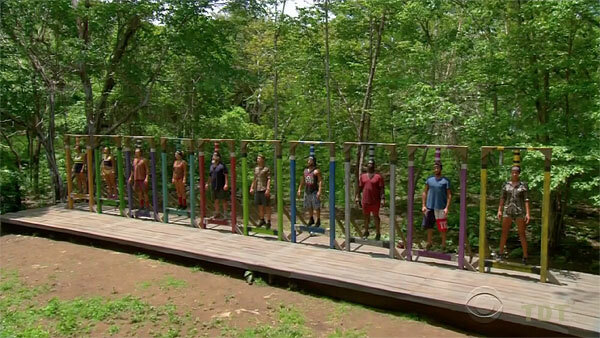 Pre-game Ep1: "It's Survivor Warfare" Ep2: "It Will Be My Revenge"
Arrival - Contestants are separated into three tribes: Masaya (white collar), Escameca (blue collar), and Nagarote (no collar). One representative from each tribe (Joaquin, Dan, Will) must make a choice for the tribe. 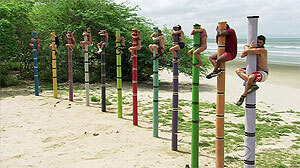 Each tribe selects someone (So, Mike, Jenn) to join them. The choice is made after arrival at camp, and it's between 'Honest' (large bag of beans) or 'Deceive' (smaller bag of beans plus a hidden idol clue). Filming begins; 18 people, 3 tribes. After suspecting So and Joaquin had an idol clue, Carolyn observes their movements, and sees So searching trees. Carolyn then identifies a likely tree, and finds Masaya's idol in it. Ep1 idol: Carolyn finds Masaya's idol. Ep1 RC/IC - Ladder Daze. 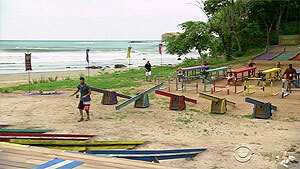 Contestants must run down a ramp, through a pile of hay, across an obstacle, and remove a ladder from a cage (choice of locks or knots). All three tribes initially try to unlock the ladders (Vince, Lindsey, Joaquin), but swap out and untie knots instead (Joe, Mike, So). They then climb the ladder to cross a barrier, move the ladder through two tables, retrieve a choice of three puzzle bags (Masaya choices an 'easy' 50-pc puzzle, both other tribes choose a 'harder' 10-pc puzzle), then complete the puzzle. 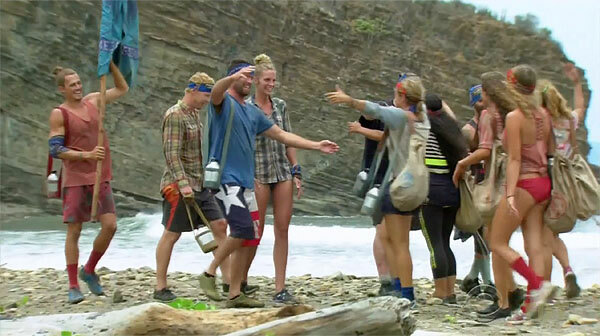 All three tribes swap out their initial puzzle person (Jenn, Sierra, Shirin) for someone else (Joe, Mike, Max). In the end, Nagarote finishes first, winning immunity and a fire-making kit. Escameca is second (immunity plus flint). Masaya loses, after blowing a huge lead on the puzzle. Ep1 RC/IC: "Ladder Daze" - Nagarote wins, Escameca second. TC1 - So voted out (4-2), 17 left. Ep2 RC/IC - Basket Case. Kelly, Nina sit out. One at a time, five contestants must dive off a platform, move a buoy along a rope over a trellis, through the water, around a floating grate, and onto another platform. 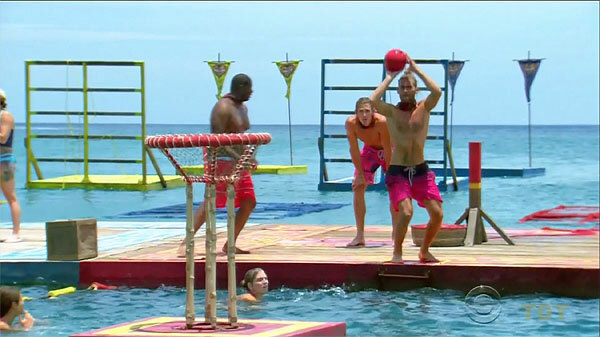 Once all five buoys are on the second platform, players must use them to shoot five baskets. Joaquin scores 5 for White Collar, they win a large fishing gear kit & immunity. Sierra sinks five for Blue Collar, they win less gear & immunity. No Collar (Vince, Joe) sink no baskets, lose. Ep2 RC/IC: "Basket Case" - Masaya wins, Escameca second. TC2 - Vince voted out (3-2-1), 16 left. 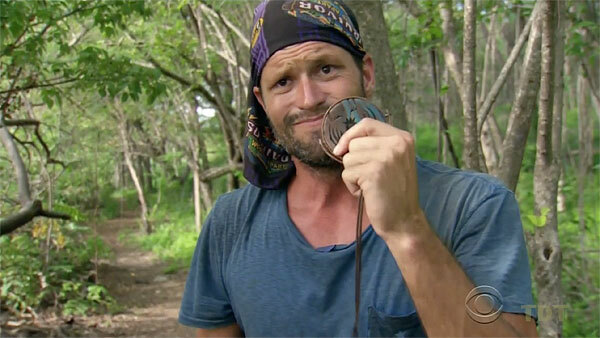 Ep3: "Crazy Is As Crazy Does" Ep4: "Winner, Winner, Chicken Dinner" Ep5: "We're Finally Playing Some Survivor"
Ep3 RC/IC - Dear Liza (as in One World). Lindsey sits out. Contestants must take a large bucket with lots of holes, cross a series of obstacles, fill it with water, then re-cross the obstacles and pour the remaining water into a bucket on a seesaw. Sufficiently filling the final bucket raises a flag. Escameca and Masaya both finish at about the same time, but Escameca wins lots of comfort items, and Masaya wins a tarp. Nagarote, who had Nina stand at the end of the course, loses. Ep3 RC/IC: "Dear Liza" - Escameca wins, Masaya second. TC3 - Nina voted out (3-2), 15 left. 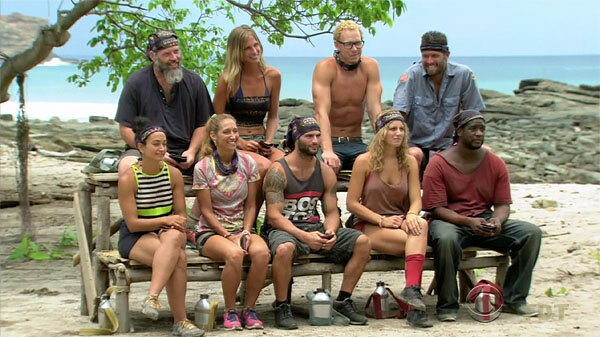 Ep4 RC - Collar Blind (as in Cagayan). Tyler, Rodney, Mike sit out. 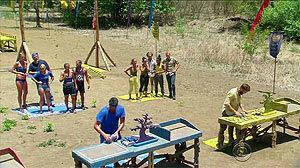 Each tribe has a caller (Carolyn, Sierra, Joe) who directs a blindfolded pair (Max-Shirin, Lindsey-Kelly, Jenn-Hali) to collect one of four (actually six, but four as aired) objects, return to the tribe's platform, where another blindfolded tribemember (Joaquin, Dan, Will) helps raise the object to the caller. Kelly gets hit in the head by the platform (thanks, Dan) and bleeds profusely, prompting a medical pause. After that, No Collar wins 3 hens and a rooster, White Collar finishes second and gets 10 eggs. Blue Collar loses. Ep4 RC: "Collar Blind" - Nagarote wins chickens, Masaya second (eggs). Ep4 idol. Jenn leaves camp to avoid watching the chicken slaughter, spends an hour looking for the idol, finds it. Jenn finds the No Collar idol. Ep4 IC - Houses of the Holey. Shirin, Dan, Lindsey sit out. 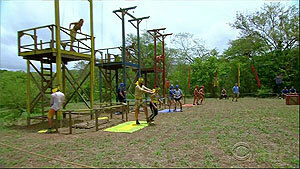 One at a time, contestants must follow a rope twisted over various obstacles until all four reach the mat. Then build a ladder puzzle, cross a barrier, and complete a semi-vertical table maze, in which the ball rests in a semi-circle hoisted by two pulleys - while balancing on a balance beam. 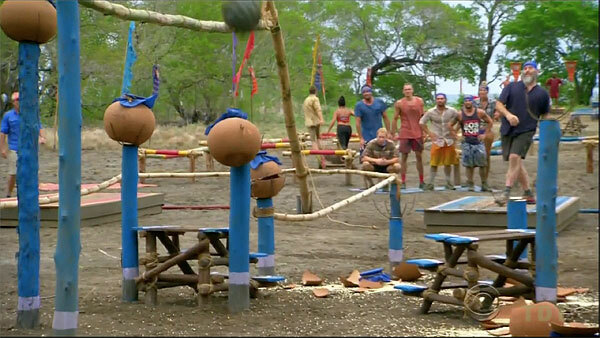 First two people for each tribe all place their balls (Joaquin, Joe, Mike, Carolyn, Jenn, Sierra). 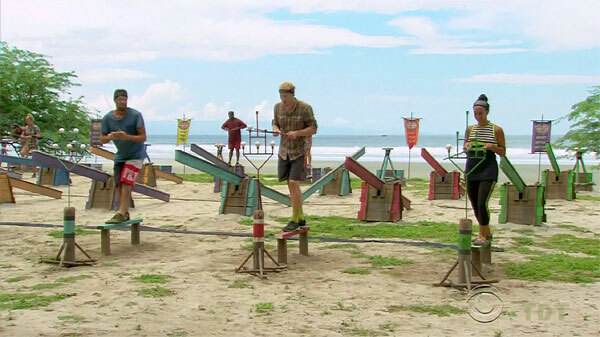 Then Tyler drops out and Max takes over, then Hali wins for No Collar (meaning Will didn't participate in the maze segment). 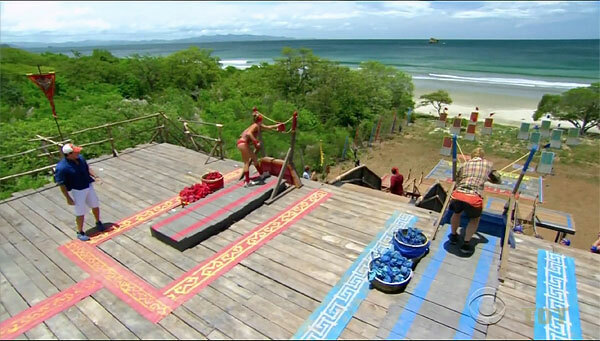 Kelly steps off the platform, and Rodney replaces her. Max beats Rodney, meaning Blue Collar loses. Ep4 IC: "Houses of the Holey" - Nagarote wins, Masaya second. TC4 - Lindsey voted out (2-2-2 [3-0]), 14 left. 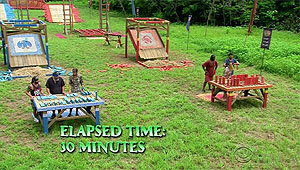 Ep.5 Tribal swap - After a random buff draw, two new tribes (Escameca, Nagarote) formed, with seven people each. Tribal swap, two new tribes of 7 people. Ep5 RC - Beach Balls. Traditional slingshot/catching balls in nets. Catching matchups: Jenn/Joaquin, Max/Joe, Will/Mike, Kelly/Tyler. Rest take turns launching. First tribe to 5 catches wins. Results: 1. Launchers: Shirin, Rodney - Max, Joe catch (1-1). 2. Launchers: Carolyn, Sierra - Joe, Tyler catch (1-3). 3. Launchers: Dan, Hali - Joaquin catches, Joe misses (1-4). 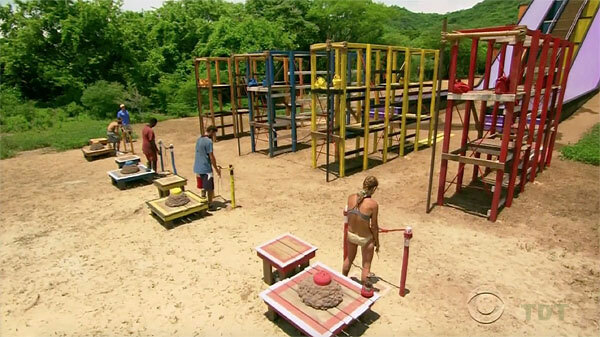 4.Launchers: Sierra, Shirin - Will misses, Mike catches (1-5). New Escameca wins sausages plus all of White Collar's rewards. Ep5 RC: "Beach Balls" - Escameca wins. Ep5: "We're Finally Playing Some Survivor" Ep6: "Odd Woman Out" Ep7: "The Line Will Be Drawn Tonight" Ep8: "Keep It Real"
Ep5 IC - Swing Break. As in Philippines, except jars must be hauled on a sled through a muddy obstacle course, instead of carried on the shoulders. The hopelessly physically overmatched New Nagarotes are lapped on the loading phase, and Dan breaks all of New Escameca's pots before Nagarote even reach that part of the challenge. Ep5 IC: "Swing Break" - Escameca wins. Ep6 RC - Air Raid. Dan sits out. 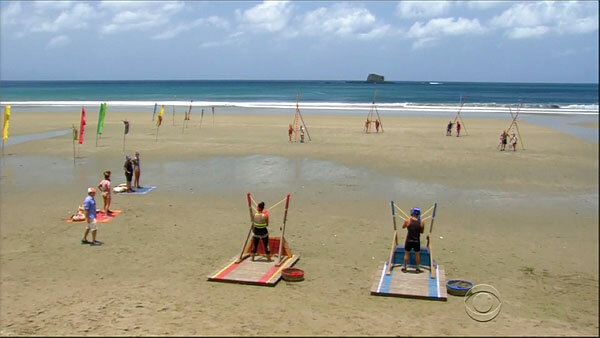 Contestants must race across a series of obstacles, then take turns shooting sandbags via a giant slingshot, at targets a long distance away. First tribe to six wins. Points made: Jenn (1-0), Rodney (1-1), Kelly (2-1), Joaquin (2-2), Sierra (2-3), Hali switches out, Mike (2-4), Carolyn (3-4), Shirin (4-4), Joe (4-5), Will (5-5), down to Tyler vs. Jenn… Jenn hits again, Nagarote wins, 6-5, gets turtle visit, food. Ep6 RC: "Air Raid" - Nagarote wins turtle voyeurism. Ep6 IC - Shut Your Trap. Joaquin sits out. As in One World, except players only have to memorize six items. Carolyn (right) d. Rodney (wrong) (1-0); Hali (right) d. Sierra (wrong) (2-0); Joe (right) d. Will (wrong) (2-1); Dan (right) d. Shirin (wrong) (2-2); Kelly d. Mike, eventually (Mike throws it). Not shown participating: Jenn, Tyler. Nagarote wins, 3-2. Challenge probably actually was first to five wins. Ep6 IC: "Shut Your Trap" - Nagarote wins. TC6 - Joaquin voted out (4-3), 12 left. Ep7 merge. 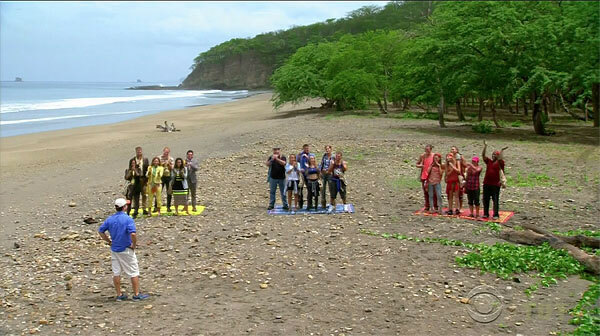 Both tribes are directed to a beach, where they find a chest (with the merge feast), and a treemail announcing they've merged. They must live at Escameca camp, although upon returning to it, they discover production destroyed their shelter, and they must rebuild from scratch. Even worse, they call themselves Merica. Tribes merge, regrettably named tribe formed. Ep7 IC: Get A Grip. The age-old hold onto a pole challenge. Results: 12.Dan, 11.Will (immediately), 10.Tyler, 9.Sierra, 8.Shirin, 7.Kelly (all quick), (25 min) 6.Mike, 5.Rodney, (Jenn stung) 4.Hali, (rain) (55 min) 3.Jenn, 2.Carolyn, 1.Joe wins. Ep7 IC: "Get A Grip" - Joe wins. TC7 - Kelly idoled out -4-1, 11 left. Ep8 RC: Anchorman. An individual challenge (?!) 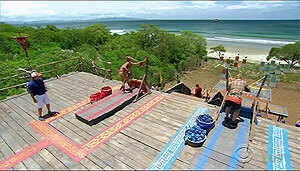 Contestants must cross a balance beam, untie one of three bags, and continue across the balance beam to a mat. First three to collect all three bags advance (Joe, Mike, Hali). Rodney falls off with the final bag, must re-start, Sierra finishes just out of the finals in fourth place. In the final stage, contestants must complete an anchor puzzle. Joe wins lunch and a zipline tour of the Nicaraguan canopy (where he finds an idol clue in a bottle). He brings Tyler, Will, Carolyn, and Shirin with him. Ep8 RC: "Anchorman" - Joe wins. Ep8: "Keep It Real" Ep9: "Livin' on the Edge" Ep10: "Bring the Popcorn"
Ep8 idol. Mike stealthily observes Joe sharing his idol clue with Tyler, then gets Tyler to repeat the clue to him. After publicly announcing that Joe found the idol, Mike hunts for it himself, eventually finding it. It's the old Escameca idol. Ep8 IC: "Hip to be Square" - Joe wins. TC8 - Hali voted out (7-4), 10 left. Ep9 RC: O-Black Water. Schoolyard pick (unshown) into teams of five: Red (Joe, Jenn, Will, Carolyn, Rodney) and Blue (Shirin, Tyler, Mike, Sierra, Dan). 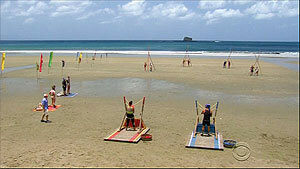 Contestants must swim, climb a ladder, slide down a slide, cross a water-net crawl, then cross a floating balance beam. 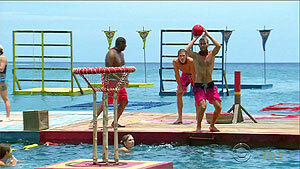 Once all five contestants reach the final dock they must use a grappling hook to retrieve five rings. Jenn, Joe, Carolyn try for Red, Sierra, Mike for Blue. Blue wins, 5-3, and gets a chocolate/candy feast. Also, for some reason, towels. Ep9 RC: "O-Black Water" - Mike, Sierra, Shirin, Dan, and Tyler win. Ep9 IC: Keep On Your Toes. As in Cagayan. 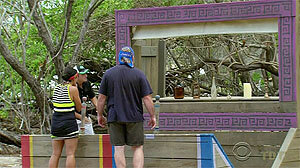 Contestants must stand tip-toed on a platform, using their head to keep a block of wood pushed into a frame above them. Longest standing wins. 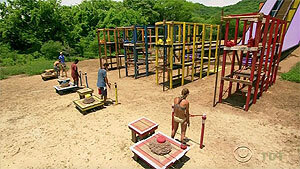 Order of elimination: 10.Carolyn, 9.Will, 8.Shirin (quickly), 7.Rodney, 6.Dan, 5.Sierra, 4.Joe, 3.Mike; (30 min.) 2.Jenn, 1.Tyler wins. 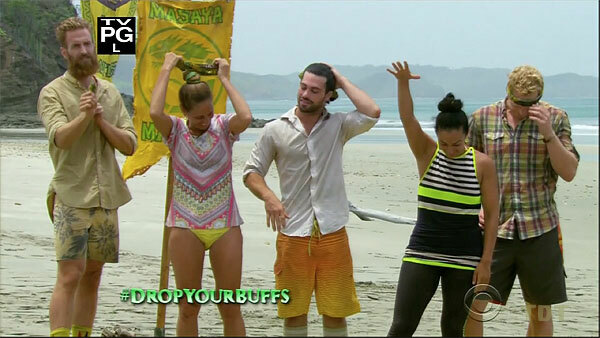 Ep9 IC: "Keep On Your Toes" - Tyler wins. TC9 - Joe voted out (5-4-1), 9 left. Ep10 Auction. Will opens the auction bidding $100 for a covered item, which turns out to be a note evicting him from the auction (back at camp he receives a clue to a hidden stash of food, though). Shirin counsels everyone that letters from home can be had by everyone at whatever the final bid ends up at, so Sierra bids $20, and all collect letters. Mike, Carolyn, Dan all bid $480 for an 'advantage', they draw rocks, and it goes to Dan. 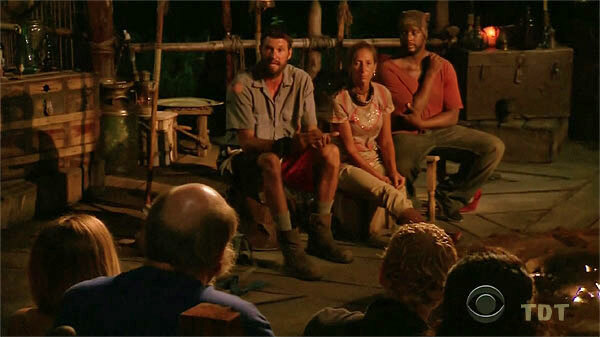 It allows Dan to cast a second vote at Tribal Council. Ep10 RC: "Auction" - Dan buys new voting advantage. Ep10 IC: Soul to Squeeze. Contestants must use tongs to move six billiard balls, one at a time, across two teeter-totters, placing them on a metal stand. If they drop the ball or fall off, they must return to the start. Results: 1. Mike wins easily (6 balls); 2.Tyler (4); 3.Dan, Rodney, Carolyn (2); 6.Sierra, Jenn, Will, Shirin (1). Ep10 IC: "Soul to Squeeze" - Mike wins. TC10 - Jenn voted out (5-3-1), 8 left. 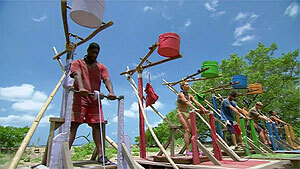 Ep11: "Survivor Russian Roulette" Ep12: "Holding On For Dear Life" Ep13: "My Word Is My Bond"
Ep11 RC: Barrel Bridge. Schoolyard pick for two teams of four (unshown). 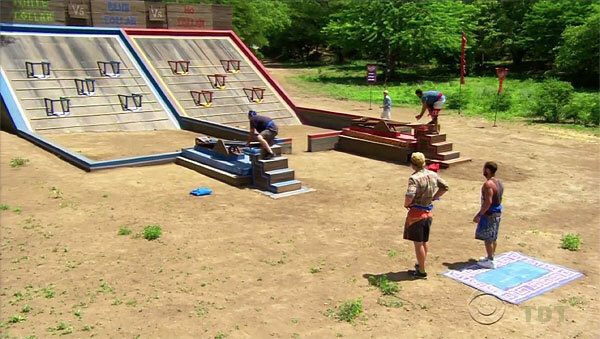 Blue team (Mike, Shirin, Sierra, Rodney) vs. Red team (Tyler, Carolyn, Dan, Will). 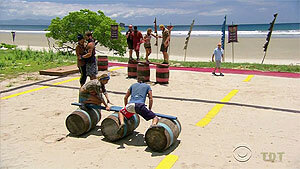 As in Nicaragua, teams must use four barrels, two planks, and some rope to cross a large sandy field. If anyone falls off or the planks touch the ground, entire team must return to the start of one of three sections. Red team eventually wins, gets a catamaran trip with cheeseburgers and pie. 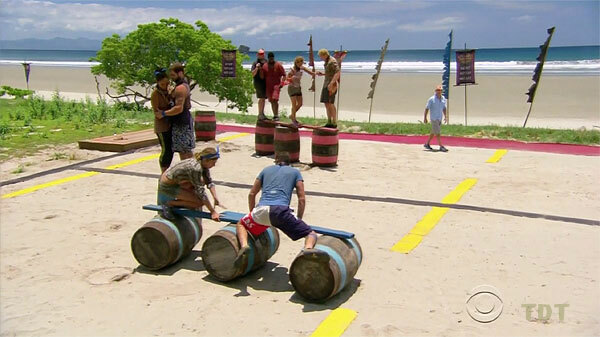 Ep11 RC: "Barrel Bridge" - Tyler, Carolyn, Will and Dan win boat-bound burgers. Ep11 IC: Water Weight. 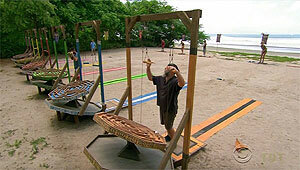 Each contestant must hold up one-fourth of their starting body weight by preventing a rope wound around a metal handle from unspooling. Separate immunity for men and women. Order of elimination: F3.Sierra (15 minutes), M5.Tyler, M4.Will, M3.Dan, F2.Shirin, F1: Carolyn wins for women; M2.Rodney, M1: Mike wins for men. Ep11 IC: "Water Weight" - Mike & Carolyn win. TC11 - Shirin voted out (4-2-2), 7 left. Ep12 RC: Dulcimer Stomp. Will is not picked, has to sit out. Red team (Mike, Carolyn, Sierra( and blue team (Dan, Rodney, Tyler) must unwrap a maypole, releasing a key, then complete a ladder puzzle, climb the ladder to retrieve a ball bag, climb through a tight net crawl, then use a catapult to launch 5 balls into baskets. Red team wins, they serve as goodwill ambassadors, delivering items to a local orphanage (then eating barbecued chicken). Ep12 IC: Back Splash. 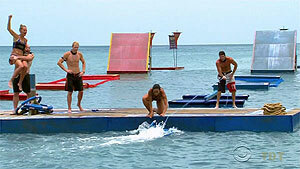 Contestants must lean out over the water, holding on to a rope. After 15 minutes, move down to a lower knot. All seem to reach the third knot (first stages not shown). 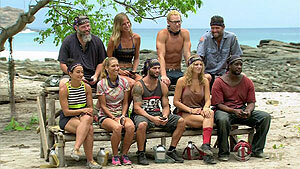 Order of elimination: 7.Will, 6.Dan, 5.Sierra, 4.Rodney, 3.Mike (out on transition to fourth knot), 2.Tyler, 1.Carolyn wins. Ep12 IC: "Back Splash" - Carolyn wins. TC12 - Tyler idoled out (-3), 6 left. Ep13 RC: For-Word Progress. Red team: Mike, Carolyn, Will. Blue team: Rodney, Sierra, Dan. Teams must cross net obstacle, rope ladder, untie knots to release a drawbridge, chop a rope to release puzzle pieces, then complete a 27-letter word puzzle. After an hour, red finally gets it ('A reward with all the fixins'). They win a helicopter surf & turf picnic. Ep13 RC: "For-Word Progress" - Mike, Carolyn, Will win helicopter picnic. Ep13 IC: Puppet Master. As in a South Pacific Ozzy-Cochran duel. 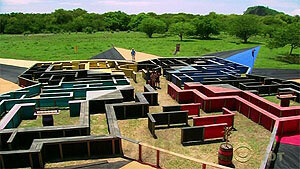 Contestants must use a grappling hook to retrieve three ball bags, then use one ball to complete a suspended table maze. Mike and Sierra both have their ball in the center circle; Mike wins. Dan & Will are on the table maze stage, Rodney & Carolyn are still trying to get their third bag. Ep13 IC: "Puppet Master" - Mike wins. TC13 - Dan idoled out (-2), 5 left. Ep14 RC: The Home Stretch. Loved ones (Mike's mom, Sierra's dad, Rodney's dad, Carolyn's husband, Will's wife) observe. 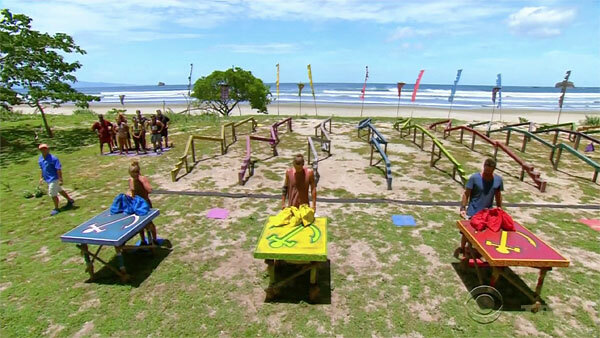 Contestants must race under a net crawl, slide a set of tiles along a shuffleboard table, then transport the tiles on a spatula across multiple obstacles to a puzzle table. Pairing the patterns on the tiles reveals three with no match, which are the three numbers (in some order) of a combination lock. First to unlock wins. Mike wins, Sierra working on her combo, other three still transporting tiles. Mike wins an overnight camp visit from his mom, Deborah, and an advantage at the next IC (30-minute blindfolded preview of the maze). Ep14 Final 5 IC: Going Blind. Blindfolded contestants must retrieve four medallions from each of the four corners of a giant maze, then find the immunity necklace. Final score: Mike wins (4 medallions + necklace), Rodney, Sierra have 2 medallions, Carolyn, Will have 1 medallion. Ep14 F5 IC: "Going Blind" - Mike wins. TC14 - Sierra voted off (4-1), 4 left. Ep14 Final 4 IC: Final Four-Titude. Contestants must untie knots, race up a staircase, untie a key, slide down a water slide, move through a multi-story obstacle, retreive a puzzle bag, drop it, then repeat for two more bags. 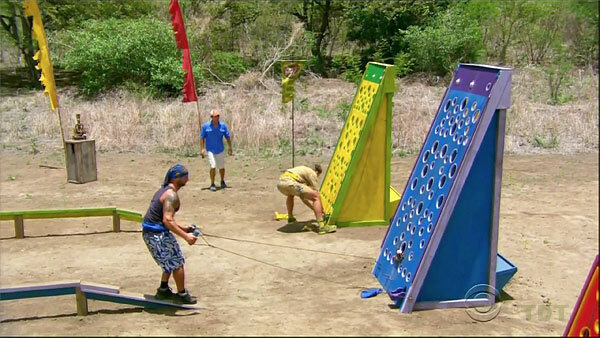 Once all 3 bags are retrieved, contestants must complete a lighthouse puzzle. Mike wins, Carolyn close behind, Will barely started on puzzle, but ahead of Rodney. Ep14 F4 IC: "Final Four-Titude" - Mike wins. TC15 - Rodney voted off (2-2, loses tiebreaker), 3 left. 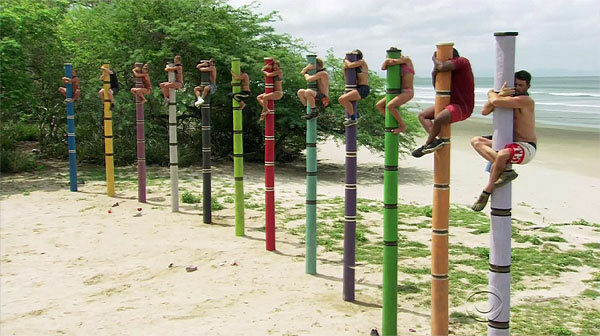 Ep14 Final Tribal Council: Mike wins, 6-1-1. Sierra votes for Carolyn, Rodney votes for Will, and everyone else votes for Mike. Departure. Contestants fly back to the U.S.. Survivor 29 begins airing one week from today.